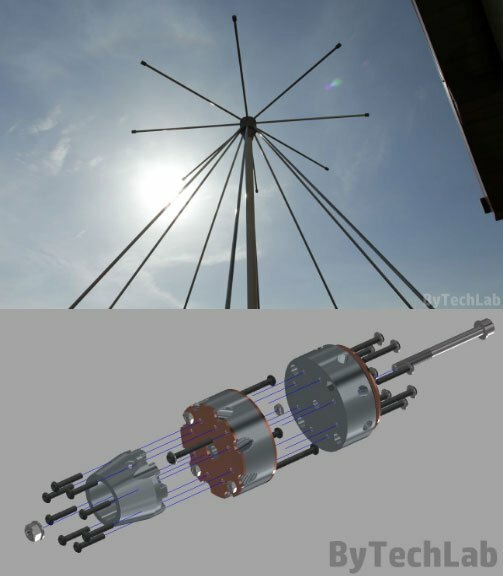 Over on his blog author ByTechLab has posted about his 'mostly 3D printed' discone antenna. A discone is a type of wideband antenna, so it is commonly used with SDRs like the RTL-SDR that have huge frequency ranges. Building a discone can be difficult, but ByTechLab shows that with a 3D printer it is possible to print the aluminum rod mounts, which significantly reduces construction complexity. His post shows the exact directions, and the stl files are available over on Thingiverse. Note that back in March we saw another 3D printed discone by mkarliner that used a full cone design with the cone being made out of aluminum tape. Discones based on aluminum rods should however be more weather resistant, and more able to withstand wind loads, so ByTechLab's design is more suitable for permanent outdoor mounting.